Situated approximately 6.5 miles north of Potter Point, Middle Island received its name as a result of its location midway between the North Point of Thunder Bay and Presque Isle. The island had long represented a "triple-edged sword" to mariners. Marking a turning point in the course for vessels making up and down the coast, the island's lee side also represented an excellent harbor of refuge in which to escape Huron's fury. However surrounded with shoals with depths of less than six feet on all but its northeast side, the refuge could be hard to find in dark of night or in the thickest weather. In fact, the area was considered dangerous enough that the Life Saving Service built a station on the island in 1881 to help service ships in distress in the area. 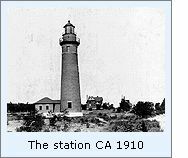 As one of the final links in a growing chain of coast lights being constructed along Huron's western shore, the Lighthouse Board finally recommended that an appropriation of $25,000 be made for a light and fog signal on the Middle Island's eastern shore in its annual report of 1896. With no appropriation forthcoming, the Board reiterated its request in each of its annual reports for the following six years, until Congress finally responded favorably with the requested appropriation on March 3, 1902. The site was surveyed and preparations for construction began the following year, with the contract for the construction of the tower, double keepers dwelling and fog signal awarded early in 1904. The lighthouse tender AMARANTH delivered materials and a working party on the island on June 11, and work on the tower, dwelling and fog signal began immediately, all of which were constructed of brick on dressed stone foundations. Work continued through the 1904 season of navigation until winter's icy grip forced the crew to secure the buildings and abandon the station for the winter. The AMARANTH returned to the island soon after the opening of navigation in 1905 along with the working party, the iron work for the tower and the fog-signal apparatus, both of which had been completed under contract during the preceding winter. With work on the large two story red brick duplex keepers dwelling completed on April 26, the crew turned its attention to the tower and fog-signal buildings. 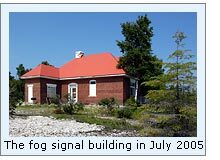 The red brick fog-signal building was equipped with duplicate 10-inch steam powered fog whistles with a prescribed repeated 20-second cycle consisting of a 3-second blast followed by 17-seconds of silence. The unpainted buff brick tower stood 70 feet from the foundation to the center of the ten-sided iron lantern, and 80 feet to the top of the ventilator ball. The tower's location on a slight rise provided the fixed red Fourth Order Fresnel lens with a focal plane of 78 feet, with the 3,700 candlepower lamp providing a visibility range of 17 miles. 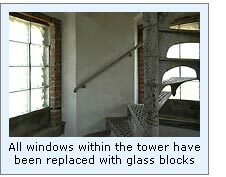 An attached service room at the base of the tower provided space for storage and maintenance of the illuminating apparatus. A frame boathouse and landing, along with a red brick outhouse rounded-out the station's complement of buildings. A tramway system was installed from the landing to the fog-signal and service room for the transportation of coal, kerosene and supplies. With the pouring of concrete sidewalks between all structures, work on the station was completed, and the light exhibited for the first time on the evening of June 1, 1905. During that fall and the following spring, the fog signal was operated for a total of 157 hours, its boilers consuming some 11 tons of coal. The following year, the AMARANTH returned to deliver another work crew and materials for the construction of a brick 500-gallon capacity oil storage building and a frame woodshed. By 1928, the station's illuminating apparatus had been upgraded to a 9,000 candlepower electrically powered isophase green Third Order Fresnel lens with a characteristic cycle of alternating 5-second periods of light and dark. The fog-signal was likewise upgraded through the installation of a compressed air-powered diaphone fog signal with a revised 20-second cycle, consisting of a 2-second blast followed by 18-seconds of silence. With the assumption of responsibility for aids to navigation assumed by the Coast Guard in 1939, the tower was painted white with a horizontal black band around the center in order to increase its effectiveness as a day-mark. Recounting the Inspector's annual visit to the Island in 1958, retired Coast Guardsman Bill Leveille recalls the Inspector asking the station crew if they would consider painting the light themselves. On hearing that the crew was unanimously afraid of working at such heights, the Inspector then asked how much it would cost to hire a private contractor to come to the island to do the job. On hearing from Ray Demarco that a quotation had been obtained for $1,400, the Inspector pondered the situation for a few moments, and then asked if the boys would be willing to do the work for $1,000. Being that $1,000 was a lot of money in 1958, the crew immediately agreed to tackle the job, to which the Inspector responded "Well boys, that's all I wanted to know - You're in the Coast Guard, and it's part of your job - start painting!" Imagine the enjoyment of swinging in the wind at the end of a rope suspended from the gallery, painting that black band. At some time that we have yet been able to determine, the black band was painted-over with the bright red band seen on the tower today, and the work of the many keepers assigned to the station was hidden from the world. After automation, the station was significantly vandalized by marauding pleasure boaters during the 1960's, and the keeper's dwelling was completely stripped of just about everything removable. 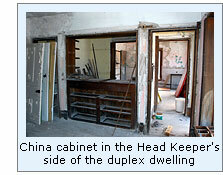 With the station decaying and in danger of further deterioration, a group of concerned citizens in the Alpena area incorporated the Middle Island Lighthouse Keepers Association on February 13, 1992, with the express purpose of restoring and preserving the structures and the history of the station for future generations. To this end, the Association has been restoring the fog signal building for use as a bed and breakfast inn, until the large keepers dwelling can be restored and converted to a similar purpose. The Middle Island Bed & Breakfast opened for business in 2001. Thus, we are happy to report that the future of this station appears secure for future generations to enjoy. 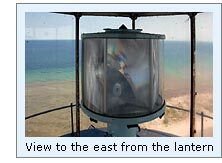 Click here to see a complete listing of all Middle Island Light keepers compiled by Phyllis L. Tag of Great Lakes Lighthouse Research. Inventory of Historic Light Stations, NPS, 1994. © Terry Pepper. This page last updated 12/02/2007 .